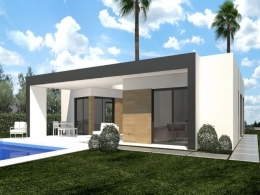 New Villas under construction and For Sale in Sierra Cortina area, Finestrat, near Benidorm. An exceptional opportunity to live and experience the Mediterranean lifestyle in these inspiring and spacious Villas, with sea views. Designed with excellent quality materials and a passion for design, the 4 Villas offer an open free flowing plan living-dining room and fitted kitchen. The comfortable 4 bedrooms are serviced by 2 bathrooms, an additional open down floor, and a magnificent solarium terrace. This project is in a very good location, near one of the most important touristic centres in La Costa Blanca.